In early June, a man was repeatedly attacked by an emotional support dog on a Delta flight. 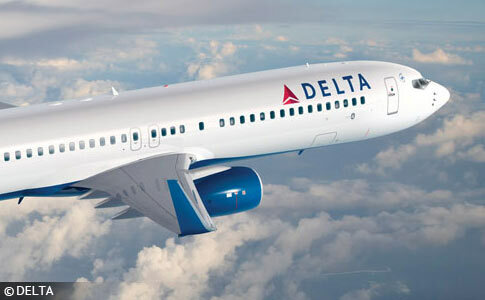 Atlanta, GA - On June 4, the widely abused loophole in three federal acts pertaining to service animals and emotional support animals went viral after a man was repeatedly attacked in the face by an alleged "support" dog on board a domestic Delta flight before takeoff. It was an escalating violent attack. 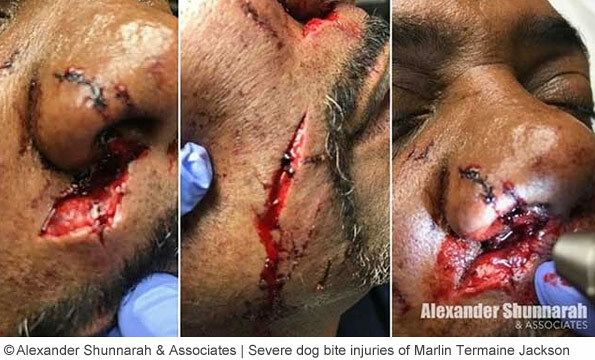 The dog's owner could not stop his canine from mauling the victim, nor did the owner heed to multiple warnings the victim asked before the attack, "Is this dog going to bite me?" In our extensive examination, we show the conditions of what likely led to this attack on Delta Air Lines and how many dog owners have been gaming the system since the revised Americans with Disabilities Act was adopted in 2010. We also discuss why emotional support animals should be limited in size in airline cabins -- these dogs do not perform a task for persons with disabilities, nor do they require any training. We address how future, similar attacks can be prevented as well. In January 2018, Delta announced "enhanced requirements" for service and support animals. The Americans with Disabilities Act (ADA) only covers service animals, which are restricted to dogs and miniature horses.1 Service dogs are afforded access to many public places, including grocery stores, public transportation, restaurants and more. Under the ADA, service dogs do not require proof of certified training, licensing or identification, but they must be able to perform tasks for people with physical and mental disabilities. Service animals are working animals, not pets. Title, address, license number and jurisdiction (state/country it was issued), phone number, and signature of mental health professional. The passenger has a mental health-related disability recognized in the Diagnostic and Statistical Manual - 4th Edition. That the passenger needs the emotional support or psychiatric service animal as an accommodation for air travel and/or for activity at the passenger's destination. That the person listed in the letter is under the care of the assessing physician or mental health professional. Safety advocates, as well as many guide dog advocates, point out the ease of gaming the system under all three acts. Anyone can purchase a fake service dog vest and credentials online -- the ADA requires neither -- and claim their dog is a service animal. An entity cannot ask a person what their disability is. They can only ask what tasks a service dog performs. No proof of certified training or licensing is required under the ADA. Thus service dog fraud is rampant today. Qualifying for an ESA under the FHA and ACAA also means having a disability, a physical or mental impairment that substantially limits one or more major life activities. For instance, being diagnosed with depression does not necessarily mean a person has a disability. The depression has to be severe enough to disable a person, rendering a person unable to cope with daily living. Many of those gaming the system with ESAs claim to have a disabling mental health condition. CertaPet.com, TherapyPet.com, TheDogtor.net and others, are for-profit entities that provide ESA letters via private online assessment. The fraud entails claiming to have a disabling condition and not truly having one under all three acts. The main difference between service dogs and ESAs is that ESAs require no training. Their only function is to provide comfort to a person with disabilities. Unlike service dogs, ESAs are largely housedogs and require no exposure to complex situations, such as a cramped, crowded airplane. Yet in most aircrafts, ESAs are allowed unrestrained in the cabin. What could go wrong? On June 4, Marlin Jackson of Daphne, Alabama, boarded Delta Flight 1430 at Hartsfield-Jackson International Airport bound for San Diego. When he reached his aisle, passenger Ronald Kevin Mundy, Jr., was sitting in the middle seat with his dog in his lap. Witnesses said the dog, described as a 50-pound lab-mix, growled at Jackson just after he got into his window seat. After Jackson asked three times, "Is the dog going to bite me?" The dog repeatedly attacked him in the face. There was a call for help. You could hear a dog growling and a bark, and someone scream, "I need help, there's a medical emergency." His face was covered in blood. It was around his eyes, his nose, his cheeks, his shirt. When he walked out, he had a cloth over his face. It was just completely bloody. The area was completely covered in blood. They came in and sanitized the area. And replaced the airplane seats. The gentleman in front of the victim and the dog owner indicated that he had cause for alarm. The dog had been growling at this gentleman and the gentleman said, "Is this dog going to bite me?" three times. We don't learn many more details until four days later, when Jackson's attorney J. Ross Massey of Alexander Shunnarah & Associates released a statement, along with photographs of Jackson's severe facial injuries. From the incident report, we learn this was an escalating violent attack, which in no way represents a common "dog bite." The 50-pound dog attacked his face once and was pulled off by Mundy. The dog broke free from Mundy's grasp and attacked Jackson again. According to Delta, the attack occurred "prior to pushback," before the plane started moving. What if the attack had occurred 15 minutes later as the plane rushed down the runway, engines roaring, with all flight attendants buckled in? Who could have helped Jackson then? What was this 50-pound unrestrained dog doing on Mundy's lap to begin with? Certainly Delta failed in their policy, which calls for the re-accommodation for passengers with larger service animals or ESAs. After Jackson was vacated and transported by ambulance to an emergency center, a Delta crew came in and sanitized the scene, according to Maddox-Peoples. The crew literally pulled out the bloody airplane seats and replaced them with new ones, she said. Local law enforcement did not charge Mundy and ultimately "cleared the dog to travel." Mundy was re-accommodated on a later Delta flight; his attacking support dog was placed in a kennel in the cargo hold for its duration. No media outlet has been able to reach Mundy since. Delta won't comment on what documentation Mundy presented to the airline. Despite the volume of news articles written about this attack, only Atlanta Patch stated the dog had its rabies vaccination. Delta does not require a health certificate for service dogs or ESAs on domestic flights -- no proof of vaccinations is required. Furthermore, as is standard in most jurisdictions, including Atlanta, there was no 10-day rabies quarantine for the dog in Atlanta. It is unknown if local law enforcement arranged for a quarantine when the dog arrived in California. Before the airplane pushed back, a large unrestrained ESA repeatedly attacked a passenger seated next to it on board a Delta aircraft packed with passengers. The dog's owner, a 24-year old active duty Marine Corps member, could not stop the dog's first attack or the second, despite the 50-pound dog being within his grasp. The 44-year old victim had no way to defend himself or escape. He was trapped in a window seat when a uncontrolled dog seated next to him attacked him in the face. Delta does not require rabies vaccinations for service dogs or ESAs. Mundy's dog was vaccinated. But bites to the face may still require rabies vaccine treatment. It is unknown if Mundy's dog ever underwent a standard 10-day rabies quarantine, which is a period used to observe a dog for rabies even if it has been vaccinated. Mundy was not charged after his unrestrained ESA viciously attacked a passenger. He was re-accommodated on a later Delta flight with his dog flying in a kennel. This type of unprovoked attack by an unrestrained dog could have resulted in a dangerous dog hearing had it occurred in any other public environment. It is unknown if there is any adjudication process when an "alleged" service dog or ESA inflicts an unprovoked severe attack upon a passenger on an aircraft. When Fox 5 Atlanta broke the story featuring the vivid testimony by Maddox-Peoples, another important piece of news came to light. Mundy, 24-years old, was seen cradling the dog in his arms in the gate area after departing the plane. According to the flight crew, they saw him weeping and repeatedly saying, "I know they're going to put him down." That was Mundy's response after his allegedly "fully trained" to behave in the cabin ESA viciously attacked a passenger in the face. According to news accounts, the police report stated Mundy was a military service member with the Marine Corps who "advised that the dog was issued to him for support." We could find no online documentation confirming this statement from any U.S. military branch, which implies the military "issued" this ESA. Recovering service members and veterans may be "eligible" for a service dog through an accredited vendor. Otherwise, it is unclear how soldiers obtain ESAs. The case against Delta is a complex one. The Delta policy states that ESAs "must be trained to behave properly in public settings" and that a kennel is not required in the cabin "if they are fully trained and meet the same requirements as a service animal." Delta's last condition conflicts with the definition of an ESA, which requires no training, not even basic obedience training. The only true requirement for an ESA in the cabin is a letter from a licensed mental health professional. The paradox is that if a person with a disability has a dog with the training of a service dog, that dog by definition is a service dog not an ESA. The FAA requires that all service animals be stowed on the floor space below your seat for safety purposes during takeoff and landing -- unless it is a small lap-held service animal. The animal may not encroach on other passengers or extend into the aisles. If a service animal is too large for these conditions to be met in a standard seat, they must be re-accommodated to a seat with more room. Delta did not follow its own service animal requirements nor did it follow FAA regulations. Jackson's attorney, J. Ross Massey, made several compelling arguments after the attack. We combined the main ones below. First, why wasn't Delta's policy for the re-accommodation of "larger service animals" followed? Second, passengers expect large dogs traveling unrestrained in the cabin to be trained to handle this environment. The other 99% of travelers on a plane have a legitimate public interest in knowing if a large unrestrained dog seated next to them is safe. Massey makes these arguments without stating the elephant in the room -- the people who are gaming the system by claiming to have a disabling condition and are taking poorly or untrained dogs onto airplanes in order to have their pets fly free. Alarmingly, these people are able to easily do so within the heavily regulated United States airline industry, where safety standards are supposed to be the highest because travel occurs at 30,000 feet in the air at 550 miles per hour! We are "concerned with Delta Air Lines' compliance with their policies to ensure the safety of all passengers," Massey said in a written statement released the to media. "It is troubling that an airline would allow a dog of such substantial size to ride in a passenger's lap without a muzzle. Especially considering the dog and its owner were assigned a middle seat despite Delta Air Lines' policies that call for the re-accommodation of larger animals." "We expect airlines to follow procedures as required and verify any dogs traveling unrestrained in the open cabin are trained for handling the large crowds and enclosed environments encountered on board an airplane," Massey said. In a subsequent Atlanta Journal-Constitution piece, Massey said, "You have two completely legitimate public interests." There is "the public interest for people who need support animals to have the support animals. But the other 99% of paying customers on that plane have a legitimate public interest as well to know that if they are seated next to a large unrestrained animal, that they can at least feel safe that that animal is trained." Recently, another glaring airline incident occurred that shows how inconsistent federal and airline policies are in regards to service animals and ESAs versus passenger safety (See: Mom forced to hold toddler during flight). The Federal Aviation Administration (FAA) and Delta allow "lap infants." A parent or guardian can travel with an infant under the age of two, about 25-pounds or less, on their lap without purchasing a ticket. Any child over the age of two is required to have its own seat. The FAA, however, recommends a government-approved child safety restraint system or device, instead of your lap because "Your arms aren't capable of holding your child securely, especially during unexpected turbulence." Yet, it was suitable, at least on this Delta flight, for Mundy to hold a 50-pound unrestrained ESA on his lap. What happened to basic passenger flight safety, such as "unexpected turbulence" or "cabin pressure loss" while holding a large service animal or ESA? According to FAA regulations, the placement of lap-held service animals (Section 3-3576) is reserved for service animals that need to be in a person's lap to perform a service for a person with a disability. Lap-held service animals can be "no larger than a lap-held child," states the FAA, which is the 25-pound limit. Otherwise, service animals must be stowed underseat within the person's foot space or re-accommodated to a seat with more room if the service animal is larger. Continuing on at the FAA website, we've inserted bracketed additions in the following: "There is no limit to the number of service animals [or ESAs] that can be on any flight. Service animals [and ESAs] do not need any health certificates to travel and they do not need to be confined in a container or cage." These animals do not need proof of vaccinations -- regular traveling pets do -- nor do they need to be confined in the cabin. Remember how easy it is to qualify for an ESA? "There are a lot of ingredients you could put in place to prevent attacks, including restricting where the dog and its owner sits or how big the animal is," Massey states in the AJC piece. We agree. The public is unconcerned about small ESAs tucked beneath a seat, whose sole function is to provide comfort to a person with disabilities. That comfort, however, must be scrutinized differently when passengers may be forced to sit next to a large unrestrained and unvetted support dog. Due to the loopholes in the ADA and ACAA that allow people to game both acts, there are more for-profit online companies than ever today promising an individual can be eligible for an ESA that is "free to fly," at least for a year. 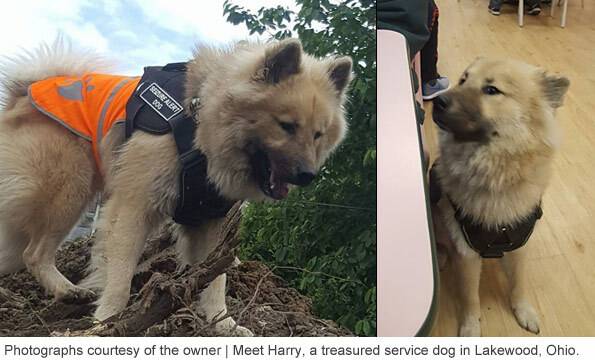 Since their emergence in 2008, the Department of Justice has done nothing to deter online companies from selling fake service dog and ESA vests and credentials either. The DOJ is enabling an even larger scale fraud than what already exists. Even in a perfect world, where no fraud existed, there is a legitimate public interest in restricting large unrestrained ESAs in cabins on aircrafts because they are not required to have any training for these cramped conditions. Even Jackson asking three times, "Is this dog going to bite me?" was not enough for the owner to take preventative action. When one combines the reality of air travel with no training or vetting legally required for ESAs, it becomes a safety issue of its own. This attack by an unrestrained ESA that disfigured a man's face, possibly permanently, should be a wake up call to the Department of Transportation regarding large ESAs in cabins. The dog's owner could not stop the first attack or the second. By federal law, airlines must accept ESAs in the cabin except when "the animal would pose a direct threat to the health or safety of others." Yet the law requires no training for ESAs either because their "sole function is to provide comfort." Though psychiatric service animals did not come into play in the Delta attack, they also warrant examination. Psychiatric service animals (PSA) are trained to perform specific tasks that mitigate psychiatric disabilities of their disabled partners. However, PSAs are treated differently under the ACAA than service dogs. Like ESAs, PSAs require a letter from a licensed mental health professional stating the passenger has a mental health-related disability when flying on an aircraft. PSAs pose additional challenges to airlines -- and a host of other entities -- because mental disabilities, such as post-traumatic stress, are as not as recognizable as physical disabilities. Service Dog Central, a high authority grassroots website, states PSAs were not always treated differently than traditional service dogs on airplanes. The requirement of a letter for PSAs by a health professional only became necessary after too many "fakers" abused the system. In 2012, the Department of Veterans Affairs (VA) stopped funding PSAs because the agency is authorized to only pay for evidence-based therapies. The VA only provides service dog benefits to veterans with visual, hearing, or mobility impairments. It reads in part, "VA has not yet been able to determine that these dogs provide a medical benefit to veterans with mental illness. Until such a determination can be made, VA cannot justify providing benefits for mental health service dogs." In late 2011, the VA launched an internal study on whether service dogs can help heal veterans with PTSD. In April 2016, the Associated Press reported that by four years into the study, only 50 dogs had been placed with veterans. Initially, three nonprofits were contracted to provide 200 service dogs for veterans, which would be compared against a control group that did not receive dogs. By August 2012, all three contracts were terminated due to biting incidents and aggression. The effort soon ran into trouble. The VA cut off two of the three dog vendors following biting incidents involving participants' children. The final contract was terminated in August 2012 amid allegations of lax veterinary care and placement of dogs "with known aggressive behavior," according to VA records. By then, only 17 dogs had been placed. "The debate has highlighted an overall lack of standards in the service dog industry," continues Breed. Medical doctors and trainers have conflicting opinions about the study's design. The VA will only pay benefits for service dogs trained by a group accredited by Assistance Dog International. Of the vendors chosen in the revamped study only one was accredited by ADI and none had prior experience training animals for veterans with PTSD. The VA's study is set to conclude in 2018. Eventually, progress will be made and increased standards of training and accreditation will prevail for psychiatric service animals for veterans. In May of this year, ADI posted to their website they completed developing definitive standards for the placement of service dogs assisting veterans with PTSD. Once the standards are ratified by ADI membership any organization seeking accreditation in order to place dogs with military-related PTSD will have to meet those standards. 1Service Animals and Emotional Support Animals, ADA National Network, adata.org (Accessed July 10, 2017). 2Prior to the revised ADA act taking effect in 2010, service animals could be monkeys and other non-domesticated animals (like reptiles). It is likely true that the horrific attack by a pet chimpanzee on Charla Nash in 2009, leaving her blinded and horribly mutilated, impacted the decision to remove these animals from protections under the ADA. 3Notably, CertaPet states in response to their FAQ, "Can I use this for campus housing?" that CertaPet mental health professionals "no longer accept university housing requests." This appears indicative of the wide spread fraud of ESAs under the Fair Housing Act over the past decade. One must assume it is not logical to believe that so many students have a physical or mental impairment that substantially limits one or more major life activities allowing for an ESA. Over the years, several university housing organizations have contacted DogsBite.org expressing the rampant abuse in this area. At least CertaPet is no longer offering these letters for campus housing. 4Delta's re-accommodation policy for larger service animals also includes when a person with disabilities has "multiple service animals." In 2015 the Department of Justice issued clarifications to the ADA. One of them was that people with disabilities may use more than one service animal to perform different tasks and that efforts should be made by entities to accommodate each. This includes on airplanes. Thus, dog owners who exploit the well-known loophole in the ADA so their dogs can fly free aren't limited to one service dog in the cabin either. 5We could find no specific "lap-held" policy for service animals or ESAs on the Delta Air Lines corporate website. But we did find information from other airlines. All of them infer or directly state a small animal, in accordance with FAA regulations. American Airlines states, "Animal must fit on your lap, at your feet or under your seat." JetBlue Airways states, "All animals must remain on the floor unless the animal can fit completely and comfortably in your lap." United Airlines states, "Small animals may remain in the passenger's lap during the flight." Spirit Airlines spells out the whole FAA clause, "If your emotional support and/or service animal must sit in your lap … provided the animal is no larger than a lap child." Southwest Airlines also uses the FAA language, "Assistance and emotional support animals can be placed on the aircraft floor or (provided the animal is no larger than a child under the age of two) on the customer’s lap." Finally, Alaska Airlines states, "Service animals should be small enough to sit in the lap of the accompanying passenger with a disability or in the personal space of that passenger's seat..."
Dogs do not belong on any form of public transportation. Not everyone likes dogs and wants a dog near them when they're trying to ride a plane or bus. Pits especially should never be allowed on any public transportation. With all of the people, noises, and actions that could trigger an attack, I'd be petrified to even breathe. Great piece of investigative journalism! I'd also be interested in seeing an even broader piece including any information on issues with dogs on public transportation, fake service dogs that have attacked other animals or people, legal battles over ESAs or service dogs having public access or housing access, and so forth. I stumble across articles here and there, like the fairly recent one about the guy who wanted to hold his pit bull on his lap on a bus or trolley (I think it was in San Francisco). There was a big brouhaha when he was denied access. That's why no one at Delta spoke up about the pit bull (oh, I'm sorry–lab mix) in the news story at the heart of this posting: people don't know the laws and are afraid to be seen as discriminatory. Who's going to question a service member in the military about his supposed service dog? Or a college student claiming mental illness and the need for an ESA? On the other hand, people are getting sick of the fraud and more are speaking up. In some cases, that's unfortunate, especially as real service dogs that were previously just quietly doing their jobs and very unobtrusive now have a negative spotlight shone on them. There are scores of YouTube videos posted by legitimate service dog handlers complaining about questioning and poor treatment related to their service dogs. Dishonest people are now causing issues for people with major disabilities who already have enough to deal with. It's sickening! And as usual, the pit pushers are right in the middle of the mess (or anything dramatic or negative related to dogs) with their rescue-dogs-turned-PTSD-service-dogs they're foisting off on military veterans, with their supposed ESAs getting around the rules against pits, with pit bull service/ESA/therapy dogs of all stripes trying to redeem the breed's reputation (oh, wait, it's not a breed). And yet plenty of them are doing the damage that pits do everywhere they go, like the one that just ran into someone else's apartment and killed a cat. So, all I have to do is take an online quiz? Great! Because I really need a hug. That's why I'm getting a boa constrictor for emotional support. It is unfortunate that some extremists, including some linked to the pit bull lobby, pushed these laws for accomodation of the shady ""emotional support dogs" while wielding power in the Obama administration Justice department. But it was the US GOVERNMENT who forced this on the airlines, restaurant owners, etc. The Justice Department sued anyone who even questioned these dogs, and the Federal government can destroy you. Until we investigate the role that government officials and employees play in these canine problems, we'll never solve them. Special interests have special power to sway those who regulate and make laws. Of course, everyone knows that the ESA pibbles just wanted to *play* with the police! And those mean ole officers shot them to death! Great article! This issue is becoming a serious problem for other service industries as well. I have a friend that owns a restaurant in the small town I live near. Last week a customer came in with a very large boxer constrained with a piece of rope. When they told him he couldn't bring the dog in the restaurant, the customer pulled out a card saying the dog was an official service dog. I'm not sure exactly what the card said, but it looked legitimate enough that they felt compelled to allow this large, rather unruly dog into their restaurant. This restaurant is small. Two tables of customers left without ordering. Everyone else was upset about the presence of the dog who did not lie quietly under or next to his owner's chair during the meal, but stood and pulled on the hank of rope so that the owner had to speak to it repeatedly. Fortunately, the dog owner ate and eventually left without further incident. But the restaurant owner was left with a lot of questions. The most important one was: What if the dog bit someone? Would the restaurant be held liable for following the law as they understood it? The restaurant owner didn't want the dog there. Other customers were denied a pleasant dining experience because of its presence. And, in my point of view, they were put in danger while simply trying to enjoy a meal out. This dog was obviously not a legitimate, trained service dog, but no one wants to call out someone who may have a disability that isn't obvious, or deny someone with special needs the right to dine at a restaurant. It's a bad and dangerous place that these players are forcing us all into. There are places that a person should be able to go (a plane, a restaurant, a store, for instance) where we shouldn't have to deal with the presence of large untrained dogs. Real service dogs are getting a "bad rap" because of this. We fostered service puppies for a while. They were always labs or goldens. And not all of them were suitable for service. Some of them washed out and just became good pets. I don't have any solutions for this. I'm just starting to get really pissed that there's nowhere you can go to get away from idiots shoving their dogs in your face and rubbing your nose in it. And pretending to have a legal right to do so. That's no lab. 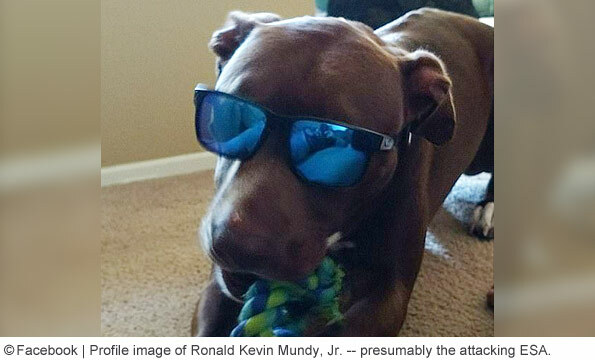 The appearance, even though obscured by sunglasses, is clearly pit bull – and the attack behavior confirms it. It's time to get tough on fraud, begin holding pit owners strictly accountable for all harm done, and take preemptive measures to avoid such attacks. Landlords, restaurant owners, and other businesses have been sued or fined by the US Government for even QUESTIONING these emotional support dogs' statuses. but doctors have their percentage of bad players too. Some doctors were just busted for running an opiod prescription ring. They would not hesitate to take money for these certificates! The bottom line here is that emotional support dogs are just pets! They are not any kind of service dog and not required by any one person more than another. How can the dog owner be active duty if he's so mentally ill he can't go outside without his fur fix? That dog looks like a pit-lab mix. kbrigan – We do try to address this issue. We know that Recovering Service Members (not under the wing of the VA yet) can be eligible for service dogs. There was just no information at all online about how/why active duty soldiers obtain ESAs. But your question speaks for itself. In fact, when we first reviewed the case in early June we "assumed" he was a veteran. Some print publications made this same incorrect assumption. He's not, he's active duty. This is beyond all bounds. It appears the dog was a pit bull as well and it was being passed of as a mix. I know about two years ago I was concerned when a woman boarded my flight, not sitting near me, with a dog. They do not belong on planes or even on streets. I wonder how Delta could gratuitously kennel the THING and still transport it. It did NOT belong on the plane and it should have been sequestered by police and then destroyed. What part of Honor, Courage, and Commitment doesn't this pit bull owner understand? I have doubts about whether he is a Marine at all. I hate stories like this because the bad dogs and bad owners (fakers) are ruining it for everyone else. The people who use real service dogs(e.g. seizure alert dogs and diabetic alert dogs) and who truly need them, will find it harder to get acceptance for their dogs if incidents of aggression from fake service animals / ESAs keep occurring. The animal pictured does not look like a lab – it appears to be a pit mix to me. I think special passports should be issued for service dogs with "service dog" clearly noted in the passport along with the service the dog performs (so embarrassing questions about the handlers disability can be avoided as the security personnel can just discretely read it from the passport). They should be issued with some security features (similar to a human passport – e.g holograms / watermarks) so they cannot be easily faked, plus come with a chip so they can be scanned in (and a photo of the dog show up). They should also have the handlers details in the front (like a normal pet passport) so that only the handler the dog is registered to can travel with it. If only service animals were allowed to travel on public transport (sorry ESA owners) then these kind of attacks could be avoided. These issues may be reaching a tipping point, and big decisions may be made soon on service dog standards, registries, breed choices, definitions, laws, penalties, etc. The ADI has made a good start in establishing standards for PTSD service dogs. Personally, I really question the wisdom of using fighting breeds as service dogs for multiple reasons. Some service dogs are specifically bred for their tasks (labs and goldens, usually). I even read a study that certain genes have been discovered in some labs indicating they're more food-motivated than others, which enhances their trainability as service dogs. Also, service dogs must be absolutely bomb-proof and non-reactive. Pits tend to be more high-strung and reactive. Look at the news stories right now of the pit mix supposed PTSD service dog for a veteran that ran away because of the fireworks. In addition to the pit bull service dogs that have attacked other animals or people, I've also read stories about them being stolen. There is also a stigma attached to them, and they're more likely to be questioned as service dogs. A person with a disability doesn't need any additional obstacles. Sadly, even some service dog handlers with small-breed dogs have had their legitimacy questioned, but at least they're not capable of serious harm. 1) A dog which as an individual has a history of aggression, including but not limited to killing, mauling, biting, nipping, lunging, growling, food aggression, dog aggression or other animal aggression shall NOT be eligible for use as a service dog. 2) A dog which according to its BREED STANDARD has been BRED for aggression, including but not limited to the American pit bull terrier, American Staffordshire terrier, Staffordshire bull terrier, American bulldog, preso canario, Dogo Argentino, Cuban bloodhound, and any other pure bred or mixed breed dog that is a combination of these dogs; shall NOT be eligible for use as a service dog. 3) A dog which according to its BREED STANDARD has been BRED to be disliking or distrustful of strangers, including but not limited to the Akita, Chow, Caucasian Mountain Dog, Cane Corso, and any other pure bred or mixed breed dog that is a combination of these dogs; shall NOT be eligible for use as a service dog. 4) A dog which as an individual has a history of disliking, distrusting, or being aggressive towards strangers shall NOT be eligible for use as a service dog. 5) Any dog which is in current use as a service dog which exhibits ANY of the above behaviors shall NOT be eligible to continue as a service dog. 6) Any dog which is not spayed or neutered shall not be eligible for use as a service dog. 7) The MINIMUM penalty for the death of a human by a service dog shall be not be LESS than half a million dollar fine and not LESS than five years in jail. The dog shall be euthanized. 8) The MINIMUM penalty for the severe injury of a human by a service dog shall not be LESS than half a million dollar fine and three years in jail. The dog shall be euthanized. 9) The MINIMUM penalty for the death of another animal by a service dog shall not be LESS than one hundred thousand dollar fine and a year in jail. The dog shall be euthanized. 10) The MINIMUM penalty for the severe injury of another animal by a service dog shall not be LESS than a fine of one hundred thousand dollars. The dog shall be euthanized. If the owner is an active duty Marine, as indicated, then he does not have, nor does he need, an emotional support animal. If he qualified for such an animal, he would be discharged from active duty. This drives me crazy. Bad enough that we can barely take our non-pit, "half lab" (horsesh$t) dogs out w/o an encounter with a pit bull, but now we can't schedule a flight without running encountering someone faking a service dog. Grrr. 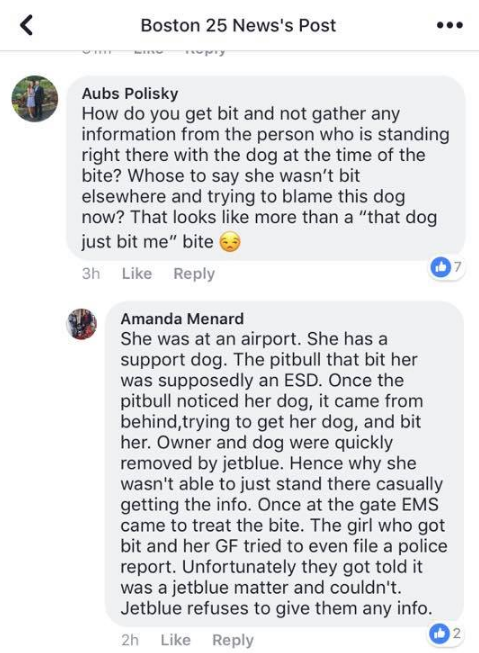 This issue is back in the news today after an alleged ESA (people are calling a pit bull) attacked a woman standing in line at JetBlue waiting to board a flight. The attack occurred at the Orlando airport. As we wrote about in this piece, Delta Airlines does not require vaccination proof for ESAs and service dogs (this could be industry-wide). In the case of JetBlue they don't even require this for non-ESA/non-service dogs. "Langlois has been calling and emailing JetBlue's customer service, trying to get contact information for the owner of the dog that bit her so she can find out if the animal is up to date on its shots. Langlois has a window of ten days before she will be forced to do it [incur rabies shots] to be safe. Immediately after the incident, she says a JetBlue agent removed the man from the line, but she never saw him again. Agents wouldn't or couldn't give her any information on the dog or the owner." We caught this screenshot too. That dog is obviously a pit mix. I cannot for the life of me understand why Delta did not require a muzzle for any unrestrained dog in the cabin. I wouldn’t want to be bit by a toy dog on a flight, let alone a fifty pound dog on someone’s lap. Why didn’t they require a dog that size to have its own seat?! What is a 24-year-old Marine doing with an "emotional support dog?" Excellent article – detailed, well written and well edited. I've long wondered if passengers can be forced to sit next to any service or support animal? What if they have allergies or perhaps fear the animal? Are the airlines required to accommodate relocate such passengers – or relocate the passenger with the support animal which would be fairer? As a former FA from the 1980's,I can tell you that if the flight is full you're not going to find anyone to volunteer to switch seats in such a scenario. EG,this reminds me of the smoking issues we had…Sometimes a passenger would not want to sit in the row directly in the front of the last smoking row. We'd try to find a willing passenger to switch seats but usually none were willing. Then it was just "too bad"for the non-smoker, even if they had allergies or were traveling with children. Would the airline rule you quoted that the animal cannot interfere with fellow passengers apply?